These guys were in our mailbox Saturday. They were sent by some agency that got our name from another agency, who got our name from some other agency to whom we may have contributed to a very long time ago. And that is why we have scads and scads of return address labels and flag stickers, etc. I'm sure most of you are acquainted with these items, having received them in your own mailboxes. But these guys have me stumped. What are they supposed to represent? Why is one row composed of stripped Smiley's? Why are the third and fourth rows winking at me? Are the guy Smiley's Gay? 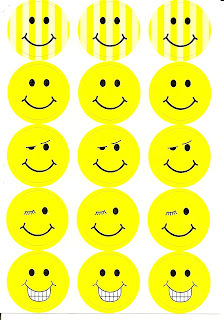 Are the female Smiley's on the make? And the last row- what did he just get away with? He looks like a winning politician the morning after the election. When I was a kid we got stuff from the Indians out in Arizona. Beaded stuff, and Plastic Crosses along with statues of the Virgin Mary. And we even got little stamped coins from the Indians which carried wise old Indian proverbs and were supposed to be lucky. We even got thermometers in the shape of Totem Poles. I can't believe my folks were annoyed with that stuff. It only cost a nickel and was really exotic to me as an 8 year old. 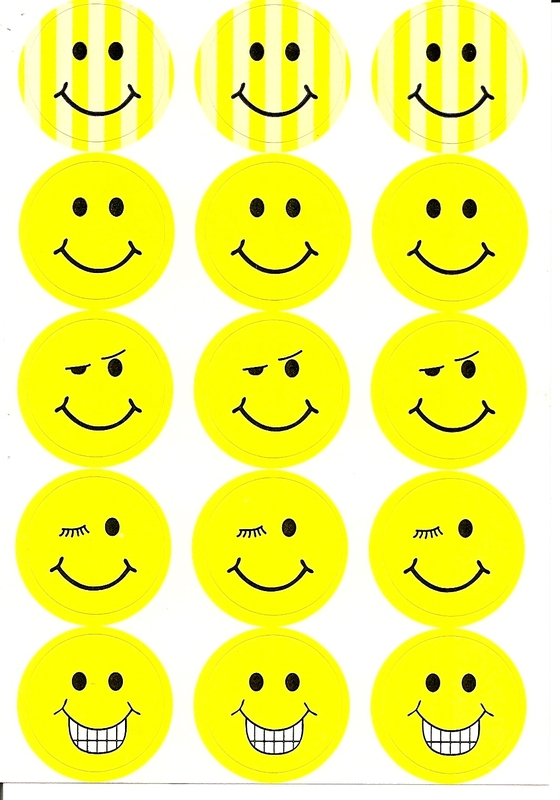 Hey, I'll trade you these Smiley stickers for one of those old plastic Indian thermometers. But, just tell me one thing, how did they ever get them through the mail without breaking?